Here you will find everything you need to know about the best mold remediation services in San Francisco Bay Area. Moreover, in this article we have given some essential tips how to cope with mold at your home. Do not pay more for the mold remediation procedure than you have to! GCD Restoration provides exceptional cleaning service at the most affordable prices in San Francisco Bay Area. GCD Restoration are here to overcome mold problem at your home, being equipped with the most powerful machines and trained staff. Mold is among the most annoying uninvited guests in our homes. Most often people take care of the mold problem because they want their home to be fresh and good-looking. However, besides of aesthetic feelings, removal of mold is necessary to guarantee the health of the inhabitants. Mold can be a serious problem, especially when talking about mold spores, which provoke deterioration of health and, in particular, the development of respiratory diseases. Mold can be found virtually anywhere in our home. Most often, however, this home-polluter is hiding in damp dwelling areas such as bathrooms and wet rooms. Poor waterproofing of the walls and roof can also prove to be a prerequisite to provoke the need to clean mold at home. Most people believe mold removal and mold remediation are actually synonyms. This turns out to be common misunderstanding. Mold remediation’s main goal is getting mold levels back to normal, natural levels. It is absolutely impossible to eliminate all the mold spores that are spread in the air. What includes mold remediation in San Francisco Bay Area, offered by GCD Restoration? The whole process of mold cleanup starts with a single call you make. When you contact GCD Restoration’s phone support center, the phone assistant will ask you several questions. The aim of these questions is better understanding of your problem in order to determine the emergency of the situation, how many experts are necessary to solve your problem and what equipment they should bring with them. The second necessary step of mold removal process is inspection of your property. It needs to be determined what the primary reason for mold appearance is. Also, experts will check whether mold has affected only one room or can be seen in all rooms of your home. You will be asked to get out of the affected rooms. During mold remediation service GCD Restoration cleaners will wear protective equipment, including masks and protective gloves. Mold spores are extremely harmful for your health and you should not get in touch with them. After the experts have specified the affected area, they will use various containment techniques to prevent the spread of mold. 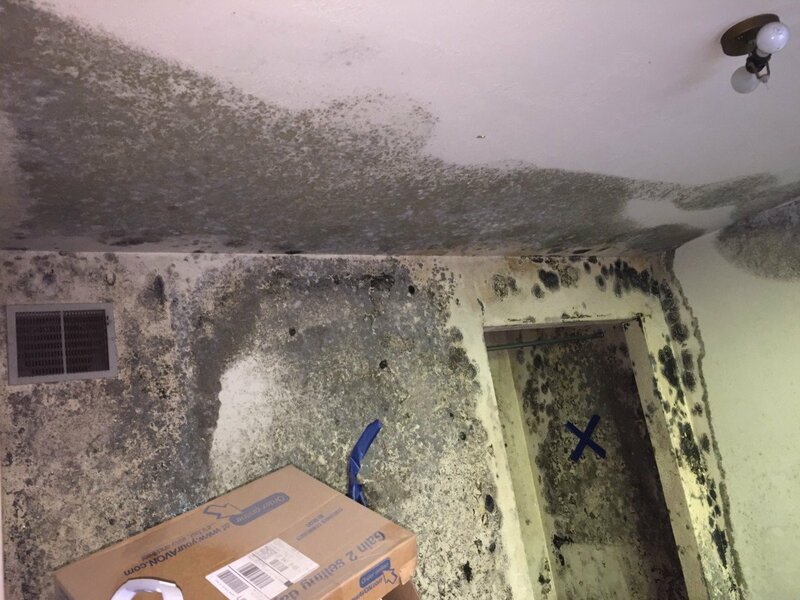 The experts will isolate the contaminated area with physical barriers and negative air pressure in order to keep the mold spores from spreading during the mold removal process. You will be asked to turn off all fans and heating and cooling systems. That action will prevent the spread of mold to the rest of your home. The professional equipment of GCD Restoration experts let them literally capture the mold spores from the air and therefore they will filter the air in the contaminated room. Basically, the mold cleanup procedure depends on the amount of mold growth and the types of affected surfaces. GCD Restoration experts apply antifungal and antimicrobial preparations to cope with mold colonies and to prevent new colonies from forming. Getting rid of mold-infested porous materials, like carpets, area rugs and cushions, may be necessary to remediate heavy mold growth. GCD Restoration professional cleaners will take care of all your possessions, bringing them back to perfect condition. They will use various cleaning methods to restore and sanitize your home. The final step of the mold remediation process is removing unpleasant odors, caused by mold. What you can do to overcome the mold problem at home? Provide isolation of the cleaned room from the rest of your home. This will prevent the mold spores from spreading easily to other rooms. It is a good idea to open the windows when possible while you are cleaning the affected room. Otherwise you literally have to seal the cleaned room. High-end air conditioners and air control machines as a whole can be a useful ally as they filter out air masses and limit the spread of mold in the rooms. When cleaning the mold, use the appropriate protective equipment, including gloves, mouth mask, goggles, etc. This is extremely urgent if you have respiratory problems like asthma and others. Pieces of decoration such as pillows, curtains and carpets, in which the mold has spread, have to be thrown out. Spores are often hidden in them, and without their removal, you will soon be confronted with the challenge of home-made mold. The room that you clean from mold should be completely and perfectly cleaned. Even the smallest gaps can bring you back where you started in a very short time. It is good to use preparations that are active against mold to handle it definitively. Remove or insulate adequately the sources of moisture. As we mentioned at the beginning, they are the reason for the development of mold in one room. If it's a bathroom, think about how you can dry it quickly and not give it a chance to develop the mold spores. Before you start furnishing again, it is absolutely essential that the room is perfectly dry. If you run out, then the probability of having a problem again increases in geometric progression. Excellent way to cope with the mold problem with natural products is to spray the contaminated areas in your home with white vinegar. What you have to do is put on protective gloves and fill a spray bottle with vinegar. Spray directly the place, covered with mold. You can use this method to clean your carpets or walls, covered in mold. Then take a damp sponge and clean the place. The vinegar odor will disappear after a few hours.